This project is more involved and took me longer than just a day. I’m very happy with the results and the fabric is well worth the cost. As a heads up, this took up quite a bit of space. I used almost every room in the condo to complete it. Kitchen, laundry room, bathroom, craft room, living room, be prepared. For the frame I used wooden stretcher bars like these http://www.rexart.com/regstretcherstrips.html?gclid=CMqj6K3P1rICFegWMgod9wkAow. I bought mine from Michael’s craft store. Before beginning, I measured out a large square of fabric from the bolt, enough to paint the front and Back pattern pieces for the tunnel top. 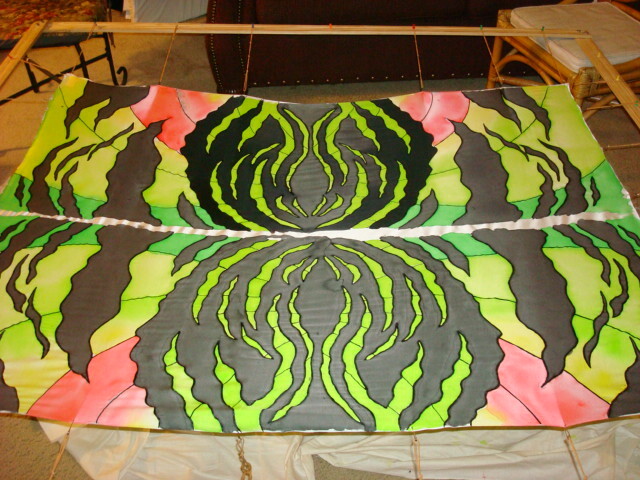 I did this so I could paint both the front and back at the same time and reduce color variations and design mismatch. 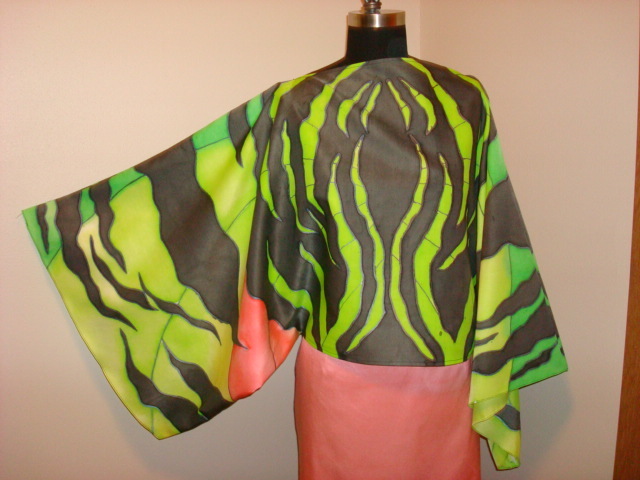 I also washed, dried and ironed out the blank fabric before starting. Next, I drew out the entire design on the paper pattern, even coloring in some of the blocks to help visualize the location of colors. I used markers on the paper pattern so that once dry I could place the silk over the paper pattern and trace the black outlines onto the fabric with the black resist. 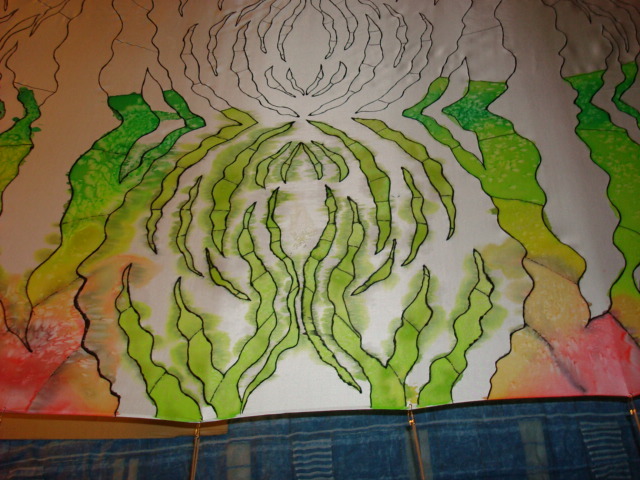 Be forewarned, the black resist seeped through the fabric and stuck to the paper in some areas because I used so much. I failed at my first attempt because I didn’t use enough resist and the color broke through the lines. You MUST allow the resist to fully dry! If it did seep through to the paper, GENTLY separate the fabric from the paper pattern. Because I was working with such a large piece, my stretching frame was huge, I ended up using molding from the hardware store for my frame. I idea is that your frame is larger than the piece you are working and up off the ground. I used my dining room chairs to life the four corners of the frame off the ground. Smaller frames, I just used books. 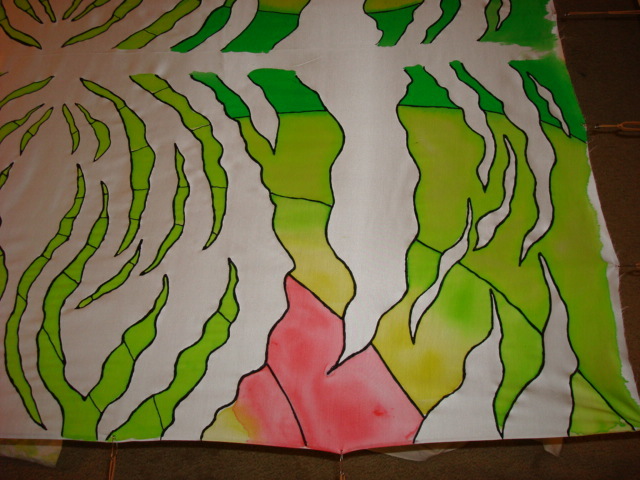 Keep in mind, when the stretched fabric is being painted and loaded with water, it will sag in the middle. You do not want it to touch the ground. Also, as an amateur at silk painting, I loaded too much paint in areas and had it drip, so place some newsprint or rags underneath. My living room carpet now has some green paint spots on it. To stretch the fabric, use the safety pins and rubber bands. I placed a safety pin about every 5-8 inches along the perimeter of the fabric, you want it to be taunt but not so taunt it damages the fabric. 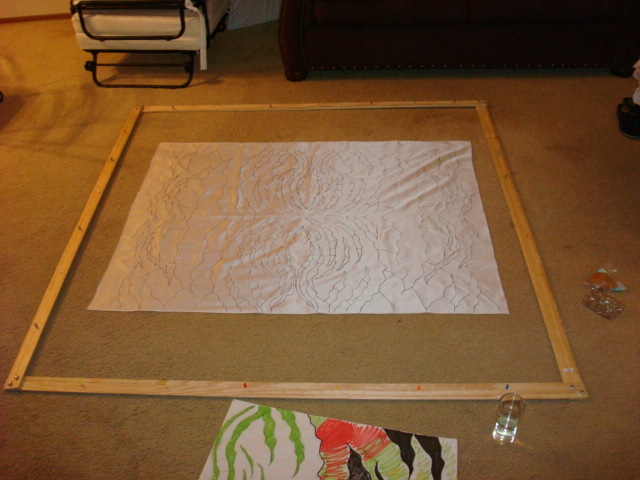 Once stretched, lift the frame off the floor with books or chairs for my over-sized frame and you are ready to paint. Yay! The fun part! 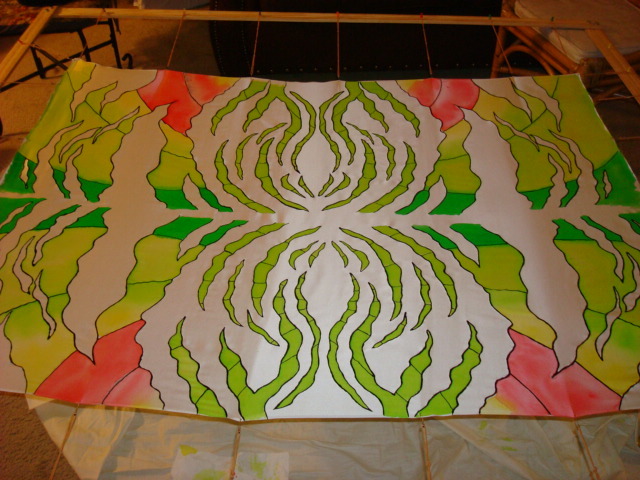 Although I’ve only dabbled in watercolors a couple times, silk painting is very similar. 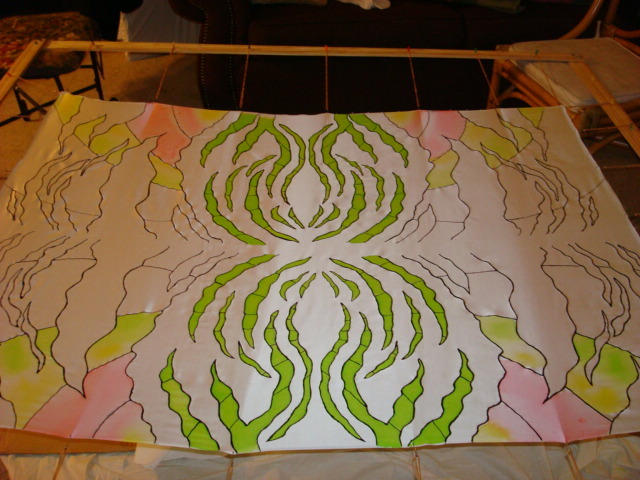 Water will wick across the fabric and spread the color very quickly. Working wet into wet worked out very well for me, just be careful, too much water will “bust” your resist lines. 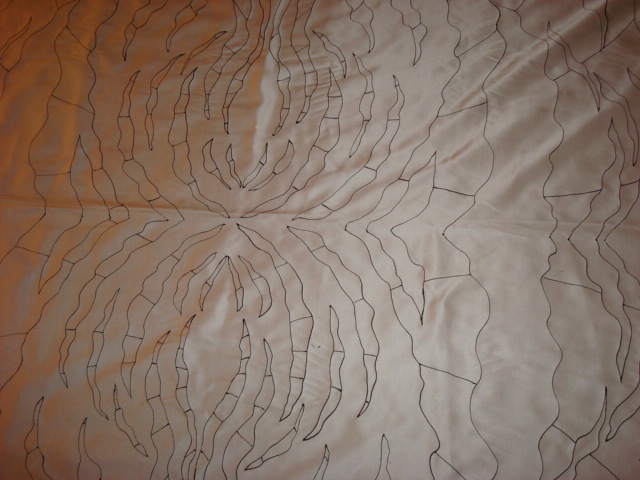 My first attempt, pictured below, is what happens when the resist lines are too thin and too much water is used. To reduce the possibility of color spilling into color, I painted a section at a time, allowing it to dry. It doesn’t take a great deal of time, just be patient. As a side note, pure black is next to impossible to achieve with dye. If any of you know a better way or better product to achieve a pure deep black PLEASE let me know. This paint created a dusty dull black, as predicted by Dharma Trading. Once the dye is dry, carefully remove it from the frame. Its best to place the frame on the floor, undo the rubber bands from the frame, and then undo the safety pins from the fabric. Next, use the newsprint layered above and below the fabric to roll the piece into a coil. Once in a coil, wrap the entire thing with aluminum foil. No newsprint or fabric should be visible. Follow the instructions that came with your dyes for steam setting. I found that my iron didn’t work as well as I’d hoped and stove-top steam setting worked the best. I’ve been experimenting with setting in the oven and it seems to produce less problems as no water or steam can accumulate on the fabric and distort the design. However, I’m still experimenting and will update at a later time. The setting can take several hours, do not rush it, be patient. Again, follow the instructions that came with they dye. Once the setting is complete, unwrap the fabric removing the newsprint and foil. I saved my foil and newsprint to use a second time. I can get two to three uses out of the newsprint and then I use it to shield my floors from paint splatter. Next, hand wash the piece to remove the excess dye. Wash until the water runs clear. If you allowed it to set long enough the piece will remain vibrant. However, if you didn’t allow enough time to set the color will wash right out, leaving a dull disappointment. Let it air dry, and its ready for sewing. Hope this was a nice introduction to silk painting. I’m still learning the techniques myself. Message me with questions and I’ll do my best to answer.